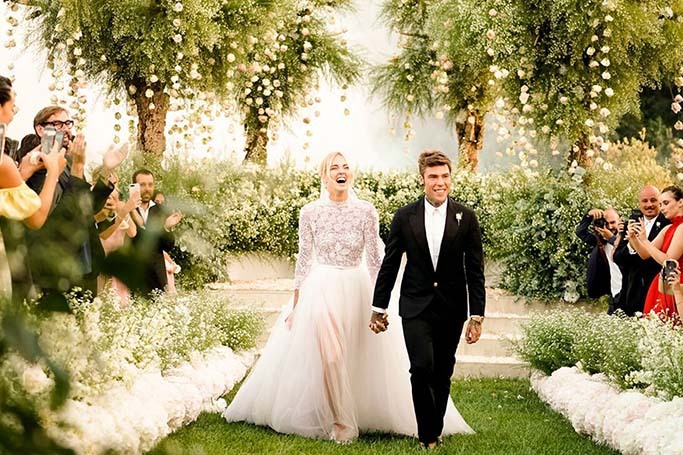 One of Instagram’s most famous influencers, Chiara Ferragni, who is known for her popular blog The Blonde Salad, married Italian rapper Federico Leonardo “Fedez” Lucia in a stunning outdoor ceremony in Sicily. Glamourous, Instagram-worthy (of course it was) and basically the Italian royal wedding, this was no ordinary wedding –as every detail was super over-the-top. From the bride’s THREE wedding dresses, to a canopy of exploding white roses and hydrangeas, this is potentially the most extravagant wedding we’ve ever seen –but damn, we wish were there! The couple flew friends and family to the wedding on private flights branded with their hashtag #TheFerragnez on everything. There were real-life cartoon characters of the newly-weds, a TV crew at the rehearsal dinner (which was way more lavish than any wedding we’ve ever been to), and a custom-made amusement park, complete with a ferris wheel, carousel and the most incredible fireworks we’ve ever seen. For the rehearsal dinner, Chiara Ferragni wore a custom-made Prada gown that literally glittered when the lit hit it. It was, of course, supplied by Prada –that’s what happens when you have 14.7 million Instagram followers, sigh. For the wedding day, the bride wore three elegant Dior ensembles, as Chiara thanked Dior for creating the dresses of her dreams, and for the wonderful gifts, sigh again!